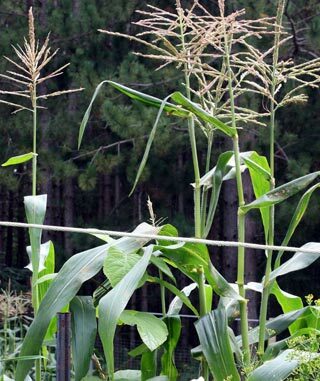 Corn plants; photo by Linda on Flickr (noncommercial use permitted with attribution / no derivative works). 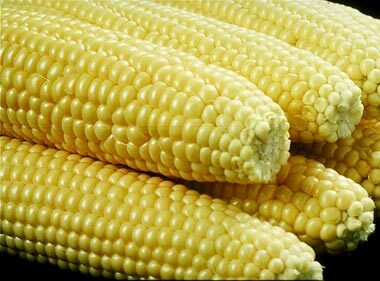 Corn is native to the Americas, cultivated by native Americans at least 7000 years ago. 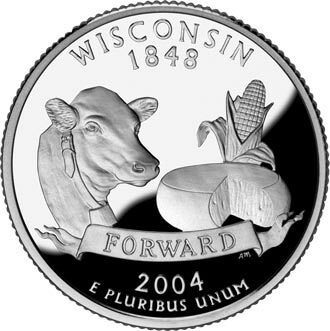 The U.S. Mint's bicentennial commemorative quarter for Wisconsin features the state motto (which is simply the word Forward) and agricultural symbols of Wisconsin: a dairy cow (the state domestic animal), a round of cheese (milk is the state beverage), and an ear of corn (the state grain). Wisconsin became the 30th state in 1848. Public domain image on Wikipedia. Corn on the cob, corn meal, and corn chips - photo by Scott Bauer, courtesy USDA ARS Image Library: Illustrations. See All Food & Agricultural Symbols - Food Holidays. Shucked corn on the cob - public domain USDA photo on Wikipedia. See All Food Symbols - Food Holidays.